It is too easy to assume that whatever it is we’re about to post is earth-shattering fantastic, but that doesn’t mean our audience will think so, too. They are interacting with our websites, Facebook pages, Twitter feeds, YouTube channels, or whathaveyou, to solve a problem. Be it finding a specific product for their home, information about a school course, making a donation, finding the time when a bus will arrive, whatever it is that drives a person to search or browse somewhere in your digital footprint in the first place. I first read these two golden rules on a blog about user experience design back in the early 2000s during my web design days (unfortunately, I can’t find the name of the blog nor link to give proper credit). These rules can be directly applied to content marketing. Actually, anything we create for online consumption. 1. Create content for the user. The user isn’t you. Like I said, it’s our job as members of the digital team (content creators, content marketers, communicators, etc.) to make it easy for our users to solve their problems. We need to simply ask ourselves, “Will our users find this fantastic earth-shattering thing useful?”. And answer it through the eyes of the members of your personas/target audience. Speaking of which, how do you make something that entices to be shared? Make it useful. Or make it funny. Make it visual. Make it quick to consume. Or make it something unexpected. We only have a few seconds to capture and hopefully hold a user’s attention. 2. Create in multiple formats for multiple consumption habits of different users. 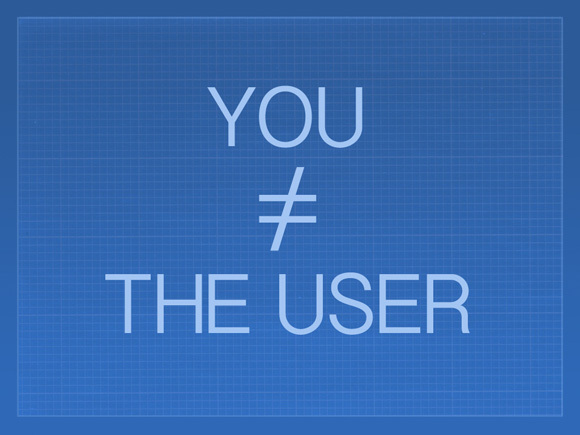 The user isn’t you. I strongly believe that brands (and individuals) need to think of themselves as publishers these days. And publishers of as many formats as possible. Why? Because some people are visual who learn by seeing diagrams, photos and videos. Others learn by reading text. Others prefer sound. Some may not have the time to check anything out except perhaps during their work commute via audio podcasts. Some learn by working with their hands. Creating and retrofitting content in multiple formats also enables us to tap into a variety of audiences in other social networks and SEO where applicable. Track how each format is doing in terms of engagement so you can also assess the appropriate amount of company resources to allocate. Plus, analytics are vital for upper management to know that the organization’s strategic goals are being met. 3. Tailor your posts to the user’s social network. The user isn’t you. Sometimes the wrong photo automatically shows up or just a link is displayed on a visual platform. We want to avoid that. The internet is more visual now and I like to take advantage of that. a) On Facebook, if your choice of photo isn’t showing up after you’ve placed your web link and there doesn’t seem to be a way to get it to show up, consider deleting your post and uploading the photo directly to Facebook. Then add your copy and paste the link to your story. Facebook is more likely to display fan page posts that keep users on Facebook than those that bring them to another website. 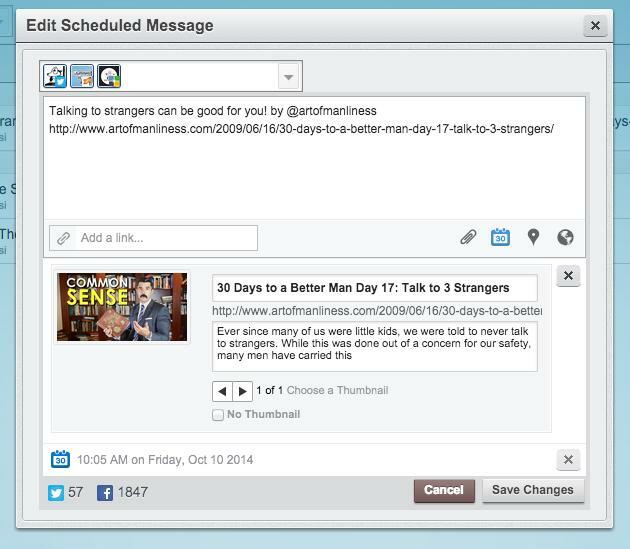 b) Scheduling posts with software such as HootSuite and Buffer can make our workflow a little easier. However, when it comes to thumbnails for our posts, be aware that (as of this writing) we don’t have much control over which photo on a web page we’d like to share will be generated into a thumbnail. I only had one choice for thumbnail or none at all. Twitter worked as it should. D’oh! – I accidentally left a break. But what’s this on Google+? Where did that Fight Club graphic come from? Yikes! I also added the Twitter mention. Google+ doesn’t use the @ symbol in this instance. They use the +. D’oh! I’m not slagging HootSuite. I use it all the time and enjoy it very much as I do Buffer (full disclosure: I’m not affiliated with either and the Art of Manliness website in any way). I used HootSuite only as an example to illustrate my point about giving up control. 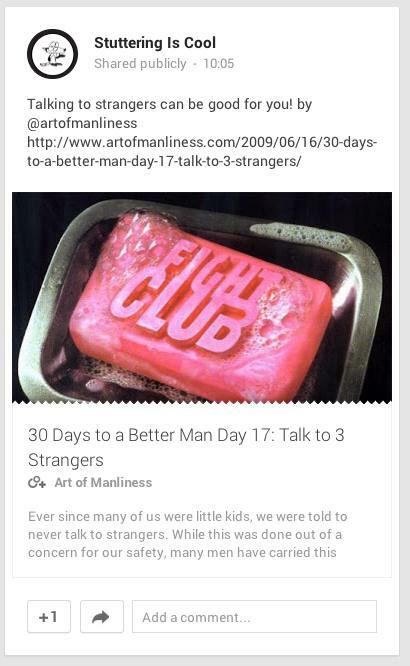 I tried it with Buffer and was able to choose between the Fight Club graphic and a WW2 era photograph of a soldier. Out of curiosity, I tried it again with HootSuite and was now able to choose between 10 thumbnails. Perplexing but you get my point. At this time, I don’t know if it’s the particular social network, Hootsuite or Buffer, the website I’m linking to or how my astrological sign is doing this month. c) YouTube now provides the option of uploading a thumbnail when the three choices it gives you from your video aren’t appealing. Goodbye to unflattering thumbnails of clients and employees! sometimes I upload a frame grab from the video using a program like VLC or I just create a thumbnail in Photoshop from scratch. d) You know how Facebook and LinkedIn automatically display the title of your web page and its summary when you post? Many times I’ve had either no text show up or just the company home page url. Both tell nothing to the user of what kind of information they will read expect when they click. Fortunately, Facebook and LinkedIn allow you to make edits. So edit! Customize the headline and description so they will, well, tell the user exactly what to expect. e) According to a bunch of research, the human eye likes to read headlines under 80 characters. Anything longer, and people may tend to lose interest and skip it entirely. There has also been some research done on how to write a headline that will entice users to want to read your content. Leave the traditional PR speak for press releases and remain social on social media. It’s best to be informal in your language. Unless, of course, you’re posting your press releases. 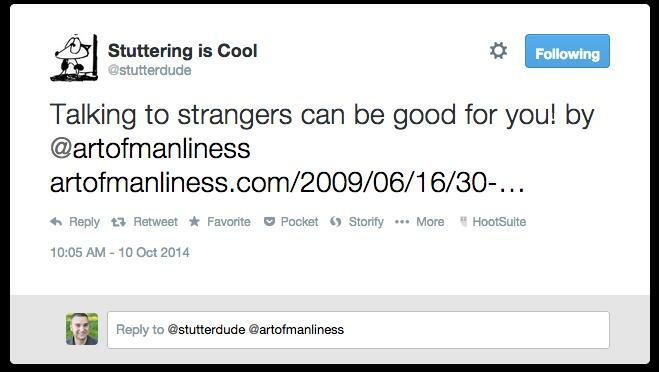 f) If you’re linking to a video on Twitter, be sure to add video in square brackets at the end of your tweet. This way users will know what to expect as their smartphones start to launch YouTube apps and such. It’s also a great way to increase clicks. This is by all means not at all an exhaustive list of tips. I’d like to hear form you! Share your tips in the comments below. 4. Analyze the user. The user isn’t you. Ideas for content fodder can be gleaned by using tools that will help you research popular keywords used in searches such as Google Ads Keyword Planner, Similarweb, SEMRush and KeywordSpy. These keywords are the terms your audience/customers are using. Not your corporatespeak. Using these words in your blog posts and web pages can also increase your search engine rankings. Google Analytics shows you most of the keywords your audience used to land on one of your web pages. The rest, labelled as “not provided”, is revealed when you pay for an Adwords campaign. You can also type your company’s name into a Google search to see what suggested search phrases show up. 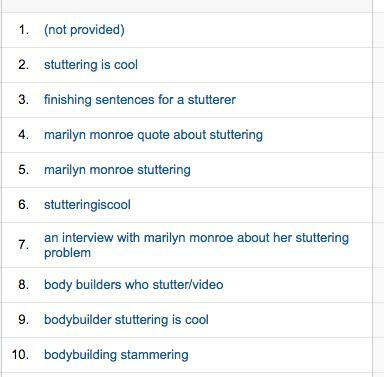 These are popular searches that people have done about your company. Do the same with the industry/subject area in which your company does business. Try typing it in the form of a question. “How to” questions are really popular on Google. Be sure to log out of Google first so you don’t get results tailored to you or your past searches. Compare the suggested search terms below after I logged out of Google with the ones above when I was logged in. Yahoo and Bing also offer the same feature. Copyblogger provides a great tutorial on everything you need to know about keyword intelligence and SEO copywriting. There are many free and paid tools available that can give us insights and proof to management on whether or not our content and community efforts are bearing any fruits. I also recommend using multiple social analytic tools such as HootSuite, DemographicsPro, Radian 6, etc. (too many to mention in this post), since each one offers something a little different in terms of features and how much they glean from a particular database (for instance, a certain percentage of Twitter’s data). Especially if you’re only able to rely on using the free versions. 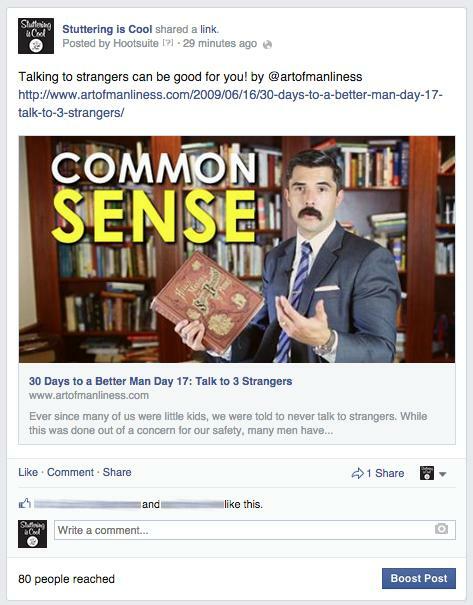 Number of hits or likes alone don’t actually reveal anything useful. For example, you can look at how a particular page performed over time. There are many questions one can ask when looking at a statistic – Is traffic coming from social networks? Geographical locations? Who did the sharing? Do they have an actively engaged community? What new learnings can come from comments? Which terms did they use to search and land on your website? Are viewers watching your entire video? YouTube now provides statistics on where in your video viewers have dropped off. Have sales increased? Of course, this is only a sample list as there there are many more questions you can ask yourself depending on what criteria determines success for your strategy or campaign. At a previous workplace, I posted some fun and heartwarming videos and photos on our Facebook page and learned from the comments we received that our audience also consisted of previous employees and former clients. It was a delight to know that they were still interested in us! Another time I was a little disappointed by the low pick up a campaign received on Twitter. Only a couple of retweets and replies. Then I took a look at who did the RTing and replying and it turned out to be a prolific blogger, a peer in the industry and two partner organizations. Not bad at all in that context! I noticed over time that the partner organizations continued retweeting our tweets and I began to retweet theirs. This resulted in building a relationship between us community managers. Seriously, design for the user. The user isn’t you. I always liked the advice of focusing squarely on your audience’s needs across the digital communications spectrum because I feel it keeps you on track with your strategic goals. Performed with due diligence and mindfulness, creating an optimized user experience all over our digital footprint, ensures that users will find the information they are looking for and (hopefully) share it and remember you for it when it’s time for making a purchase, donation or whathaveyou. This post originally appeared as a three-part series on LinkedIn.